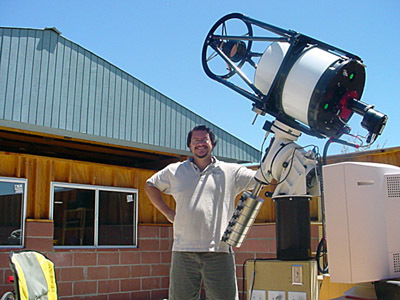 The telescope is a 16" Ritchey-Chretien from RC Optical Systems. 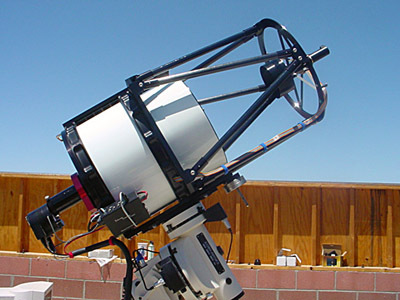 The mount is an AP1200GTO from Astro-Physics. The camera is an ST10-XME from SBIG along with the AO-7 adaptive optics system. 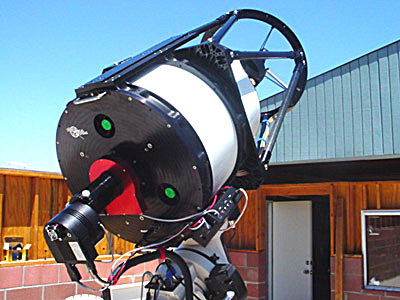 Anodized in red is the Instrument Rotator (PIR) which can rotate the camera to any angle automatically. 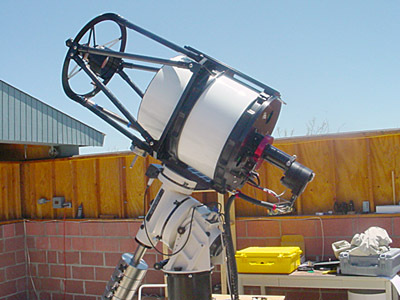 Mounted on the side of the scope is the Telescope Command Center (TCC). The TCC monitors primary mirror temperature and ambient air temperature, controls the secondary mirror position, controls cooling fan speeds, and controls rotation of the instrument rotator. Another view of the scope from the east side facing west. And to show some perspective...I'm 6 feet tall.